Getting into the swing now that the blog has passed the 2 year mark, I thought a nice side dish for upcoming holiday feasts might be nice. I suspect that this would make a good stuffing for a turkey, but I know it makes a great side dish for things like roast chicken, roast duck or goose, chicken apple sausage, and turkey burgers. The dish is savory, with just a hint of sweetness from the apple juice and a nice tang from the cranberries and orange zest. This one is similar to a recipe I've seen (somewhere) during the last month, but it has been such a absurd month...far more to do that time to do it in...that I don't remember where I saw the idea for combining apple juice soaked cranberries with a wild and brown rice combo. The reason I don't feel too bad about it is that I jazzed it up a bit on my own. I'm almost certain that the original recipe had not a whit of orange. Orange and cranberry are such a natural as a flavor duo that I had to add orange zest. I also cooked the rice in a combination of apple juice (the juice the cranberries had simmered in no less), water and chicken broth. A bit of minced fresh thyme was also my addition. In a small pot, combine the cranberries and the apple juice. Bring to a boil, reduce heat, cover and simmer for 10 minutes. Remove from heat and drain the cranberries, reserving the apple juice. In a medium pot, combine the brown and wild rice and the chicken broth. Measure the drained apple juice and add enough water to make 1 cup. Stir to combine. Bring the pot of rice to a boil, reduce heat to simmer, stir, then cover with a tight lid. Let simmer about 50 minutes, until liquid has been absorbed and rice is cooked. Check during the last 10 minutes and add a little more water if rice looks like it will scorch. 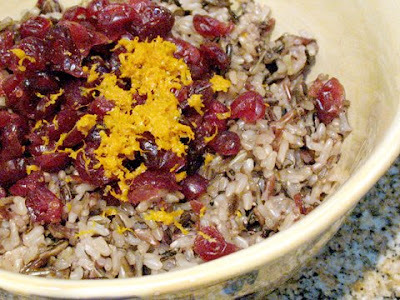 Put cooked rice mixture, drained cranberries, and orange zest in a bowl. Stir to mix. Taste, then add salt and pepper to taste. I was seeing pomegranate until I see it's cranberry. Cranberry soaked in apple juice is a dream. Your dressing looks great. Congrats on passing 2 years! I'd love to meet you again in November! i love orange and cranberry together, so this one sounds like a true winner! Tanna, Cranberries are so seasonal...but so are pomegranate seeds...they would be a good addition. Anna,I'll e-mail you some dates! Deborah, Isn't that the best combo? !